The Skinny: Noble and well-meaning, but also conspicuously lacking thrills. Midnight Eagle gets points for sincerity, not to mention its near-simultaneous theatrical release in Japan and North America. One would hope that this release strategy signals some sort of a paradigm shift for international distribution. Frankly, everyone should support this film wholeheartedly because of that. Too bad the movie isn't better. At first glance, Midnight Eagle looks quite promising. 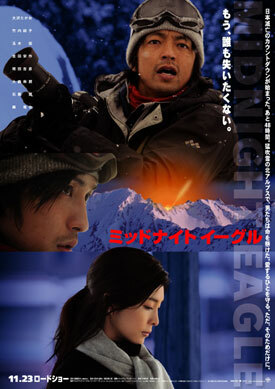 A big-budget Japanese action-thriller, Midnight Eagle possesses well-defined characters and situations, and a ticking clock storyline that would do Tom Clancy proud. The film kicks off with photographer Yuji Nishizaki (Takao Osawa of Crying Out Love, In The Center of the World), who's camping in Japan's Northern Alps when he spies a shooting star. He takes a picture and sends it to his estranged son, but it turns out there's more going on than armchair astronomy. Nishizaki's friend, reporter Shinichiro Ochiai (Hiroshi Tamaki of Heavenly Forest) is working on a big story involving the disappearance of the "Midnight Eagle", a U.S. stealth bomber carrying an obviously dangerous nuclear payload. Apparently, a couple of "Northern Agents" (From Korea? China?) sabotaged it, resulting in a crash landing in the same Northern Alps, not to mention a few lives lost. The shooting star = crashing Midnight Eagle. Determined to find the truth, Ochiai hightails it north to check it out for himself, bringing a reluctant Nishizaki with him. The backstory of Nishizaki's reluctance: once upon a time Nishizaki was a hotshot war photographer, but after witnessing too much death, he's become a burnt out shell of a man who neglected his ailing wife, who has since passed away, leaving their young son alone. Nishizaki's lousy mood is a sticking point between he and sister-in-law Keiko Arisawa (Yuko Takeuchi of Be With You), who apparently still hasn't forgiven him for choosing her sister over her. Coincidentally, Keiko is also a reporter, and is tracking one of the "Northern Agents" (Again, from North Korea? Or maybe North Dakota?) who may be in possession of the key to disarming the Midnight Eagle's payload. Time's running out, however, as the Japanese Self Defense Forces are seemingly no match for a group of heavily-armed Northern Agents, who are adept at killing highly-trained soldiers but can't kill a couple of nosy journalists even when they have the drop on them. Ochiai and Nishizaki survive numerous ambushes from the white-garbed agents, only to rendezvous with Major Akihiko Saeki (A-Saku Yoshida), who informs them of the gravity of the situation. Basically, they better stop the bad guys or they'll blow up the Midnight Eagle's nuke, resulting in plenty of lost lives and an international incident that the Japanese government would like to avoid. Can one soldier, a morose photographer, and an excitable young reporter take on a squad of deadly terrorists and save all of Japan? And can Nishizaki conquer all his personal demons at exactly the same time? Not to give too much away, but this is a commercial film designed for mass audiences, so of course all the above is possible, but not without some thick sentimentality or a few sacrifices. Midnight Eagle earns points for its nobility and do-gooder values, presenting its characters as flawed, but hugely decent individuals who understand the value of life. The problem is that nearly everyone in the film is incredibly nice, and anyone who could qualify as a foil is given zero screen time. There are evil terrorists, both in the snow and in the city, but the terrorists lack not only a national identity, but also an individual one. We never really meet the bad guys, making their threat an oddly absent one. The government is full of apologetic, very decent people, and tough decisions are made with maximum regret. Many scenes take place in the Prime Minister's War Room, and everyone is so perfectly mannered and quiet that it never seems like a national crisis is really taking place. Situations like this should inspire chaos, with bureaucrats and individuals butting heads over damage control and differing ideologies. The sky in Midnight Eagle is obviously a perfect blue, because none of that happens here. In the real world, such decency and humanity would be commendable, but in cinema, it's only a shade away from absolutely boring. Ultimately, Midnight Eagle suffers because its situations are defined by a sketchy premise that isn't fleshed out into a fascinating, enthralling whole. Despite announcing its grand military thriller aims, the film doesn't provide much besides nominal thrills, and it doesn't convince of its supposed scale. Tense events occur, but not enough is done to demonstrate the gripping inevitability of it all. Could-be thrilling technological details are glossed over in exposition. Decoding the terrorist's code involves handing a chip to someone and waiting ten minutes, meaning instead of seeing the government hackers work their magic, we get to see people sit around and worry incessantly. Despite the ticking clock, there's time for people to soul-search in the snow, cry in the War Room, or even have long conversations while engaging in a firefight. The filmmakers put their focus on maudlin character development and noble emotions, but there are simply too many syrupy, illogical conceits to fully convince an average, much less a more seasoned moviegoer, of the film's credibility.